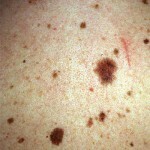 Essentially, Atypical moles or dysplastic nevi are funny looking moles that in some cases are worrisome for melanoma. When moles are closely inspected with skin microscopy or dermoscopy the pattern of pigmentation in a mole can be analyzed. 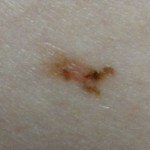 There are patterns that have been proven to be completely benign as well as features that are concerning for melanoma. Atypical or dysplastic moles do not have a benign pattern, but they also don’t have the clinical features diagnostic of a melanoma. First, severely atypical nevi clinically look very similar to early melanomas and removal is often necessary to distinguish the two. Second, atypical nevi are seen more often in melanoma patients. 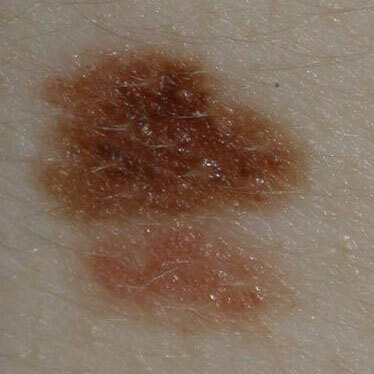 Moreover, people with numerous atypical nevi have been found to be at higher risk for melanoma and should be educated in performing monthly self examinations of their moles and have an annual skin examination to screen them for melanoma. At least 5% of people will develop an atypical nevus that should be examined by an expert dermatologist. Atypical nevi are often removed and sent to the pathology lab for testing, however, it is not always necessary. For example, clinically atypical nevi appearing that have been unchanging in size, color, shape, and pattern may not necessarily need to be removed. When atypical moles are removed and sent to the pathology lab, they usually have unusual features under the microscope that dermatopathologists (pathologists specially trained to examine skin biopsies) can grade as mild, moderate, or severely atypical. If an atypical nevus is not completely removed by the biopsy procedure OR if it proves to be severely atypical, it is often recommended to remove an additional margin of tissue to ensure complete removal.